This page uses data from Farm to Institution New England’s 2016 survey of New England producers. Two key goals of the survey were to measure the impact of farm to institution sales on agricultural producers and to understand the key barriers and opportunities for farm to institution sales in the region. Two hundred and twenty-three producers completed the survey and 71% of respondents reported that they were either selling or interested in selling their products direct-to-institution (defined as “direct sales to users such as K-12 schools, colleges, hospitals, prisons, and other institutions”). Because there is no affordable, easily obtainable public dataset of producers in New England, this survey relied on social networks to reach the broadest possible sample. FINE staff promoted the survey in a number of venues and through personal outreach to farmers. FINE staff also reached out to contacts at many organizations and asked them to forward an invitation to participate in the survey to their contacts and/or include it in their newsletters. The full report examines the differences in characteristics between producers who sell direct-to-institution and those who do not. It delves deeper into the practices, and the perceived benefits and challenges, of producers that sell direct-to-institution. It also explores sales to institutions through intermediaries like food distributors, food hubs, and wholesalers. In June 2017, we released a research report titled "Producer Perspectives: The New England Farm-to-Institution Market." This report is one in a series of reports designed to help food system stakeholders understand the impact of institutional markets on New England's food system. Producers across New England reported selling food direct-to-institution. However, more respondents selling direct-to-institution were farming in Vermont, Massachusetts, and Connecticut than the other three states. The percentage of producers selling direct to institution ranged from 4% in Rhode Island to 21% in Vermont. Producers using direct-to-institution markets reported making 49.3% of their institutional sales to K-12 schools and 30.7% to colleges and universities. Hospitals (10.2%) and other institutions (9.9%) made up about the remainder. Over half of all the respondents’ gross sales were composed of either fresh vegetables or fresh fruits. However, fresh fruits made up a greater proportion of sales for respondents selling direct-to-institution (25%) than for other producers (13%) who responded to the survey. Producers with gross sales of $50,000 and higher were more likely to sell direct-to-institution, while producers with gross sales below $49,999 were less likely to sell direct-to-institution. Producers were asked to list the top products (by value) they sold direct-to-institution. The top five products sold were tomatoes, apples, meat, carrots, and potatoes. 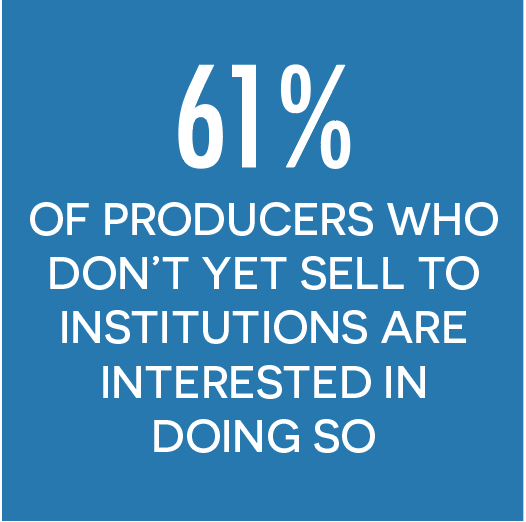 When asked how interested they were in expanding direct sales to institutions over the next five years, more than three-quarters of the producers already marketing direct-to-institution indicated at least a slight interest in each of the four different types of institutions. Producers seem most interested in expanding/initiating direct sales to colleges and universities, with at least 63.6% either moderately or very interested, followed by public K-12 schools. It should be noted that producers interested in selling to institutional markets considered potential barriers to be more problematic than those who currently sell to institutions. 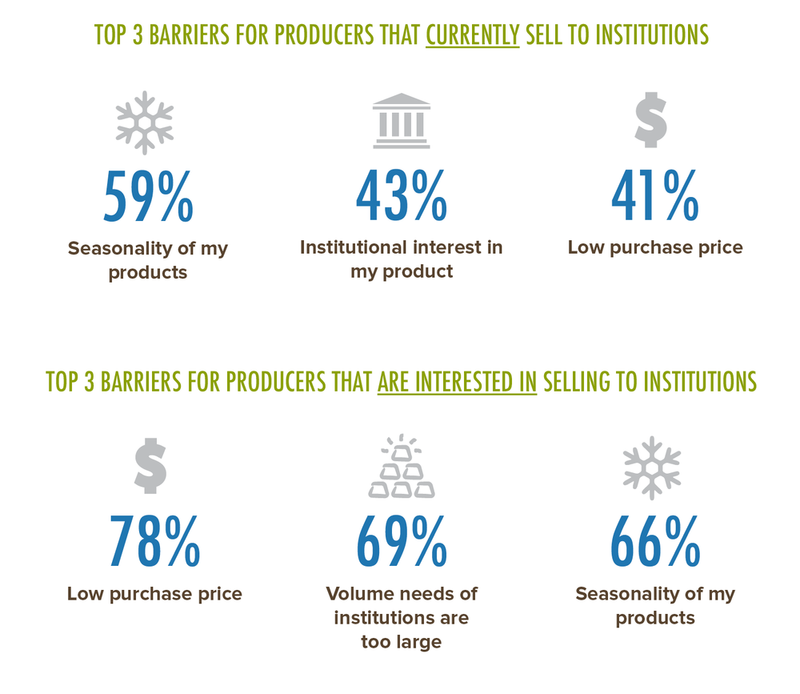 Only one barrier – seasonality of products – was mentioned by more than 50% of producers currently selling direct-to-institution while seven barriers were mentioned by over 50% of producers not currently selling to institutions. All but one of the barriers were more frequently cited by those not currently selling to institutions. This suggests that selling local food to institutions is easier than farmers expect. The top three barriers mentioned by those who do not currently sell direct-to-institution were low purchase price, volume needs of institutions, and seasonality. Respondents reported distribution, logistics, and price as the top three reasons for using an intermediary. The list of top products sold through intermediaries is very similar to the top products sold by producers direct-to institution, with the noticeable absence of meat, which does not appear at all on the list. The top five products sold through intermediaries are tomatoes, salad mix, summer squash, apples, and beets.